Topic: New Story: Hunter Renfrow responds to South Carolina fans: "We showed our class tonight"
New Story: Hunter Renfrow responds to South Carolina fans: "We showed our class tonight"
Hunter Renfrow responds to South Carolina fans: "We showed our class tonight"
Bottles of water, towels, fruit and all manner of debris rained down from South Carolina’s student section Saturday night, each toss followed by double birds. The game was still 40 minutes from kickoff and the students were already directing their anger at anything orange. How did Clemson respond to the rancor? Re: New Story: Hunter Renfrow responds to South Carolina fans: "We showed our class tonight"
During the game my sister asked if little Jakey could throw a bottle better than he could a football. Sometimes she makes me proud. The only thing little Jakey throws well is a tantrum. I agree. Jakey is best at at running off the field after another errant throw. If you add up all the yards he has running to the bench, he's definitely a Heistman candidate. 98% of these bottle-tossing kids were rejected from Clemson admissions and are rather p*ssed that they ended up in the dump that is USC. Lol Feaster..."It's just two different coaches..." BOOM! BOOM! is right. I think we saw two different cultures. AND for SCAR coach to say it was only a few fan --- WOW! Did he notice the entire lower level endzone fans throwing bottles and flipping the middle #1 finger!?!?! I think we know where the classless players will go -----. The head coach is responsible for the culture. Yet again. 34-10 runover despite their best....feeble efforts. 4-0 that'll grow to 5-0 or better until they grow up. Guess they meant never 56-7 again. Shucks. Guess Tiger fans will just have to settle for 34-10. I can completely understand the aggressiveness of the USC players, with the trash talking, late hits, etc. Straight from Malcolm Gladwell's story on being the underdog, you have to find a way to change the game plan and when you are heavily outmatched in talent and execution, there's not much else to turn to other than antics like that - in other words, there only hope to get in our head were those types of antics. One of my favorite games as a child was watching FSU dismantle UF with late hits and personal fouls to send a message early they were in charge - of course now, as a parent, that would probably make me mad, but it worked for them. We couldn't expect USC to just play their role as another stepping stone in our march back to the Playoffs - they were going to try and make it a literal dogfight. It was when the refs finally got tired of it and quit allowing it to be part of the game that I knew the game was soon to be over. As far as the fans, it is unacceptable throwing bottles on the field. I can't deny that, when I was a student at Clemson, I've imagined chunking my water bottle at an opponent or referee (or imagined catching the extra point on the hill and sending a spiral at the backjudge that called the pass interference that kept their drive alive). The difference is I only thought about those things, but never did it get to where I would act on it. I consider myself above average in self constraint, but at worst, somewhere among the middle portion of the bell curve, so it doesn't surprise me that many USC fans (especially students who were given a tether of hope at defeating us going into this game) probably made a large portion of the small area under the end of the curve with little to no self constraint or common sense, when it comes to risking physical harm on college kids that are entertaining us and showing them how you execute on a lifetime of practice and hard work at their sport. Not condoning any of it, but just saying I understand it all and have probably been on both sides of it in my lifetime. As a white basketball player, especially now nearing 40, I've learned you don't hang around quietly waiting for the other team or player to give you a chance to show you can play - you punch them in the mouth on the first possession and hope the game is over before they put together what just happened and why everyone is oohing and ahhing over them getting schooled by the underdog (of course, the ending seems to be more and more rare each year older I get). Hopefully, these scores in our rivalry with SC are going to become the norm for many years to come. You're a Tiger, Be like the Tigers was last night, it did not bother them. This picture. Coot fans are by far the trashiest off all fan bases. I understand every fan base will have one here and there but almost everyone in this picture has their middle finger up. GO TIGERS!!!! if you can't act like one. After all that and you still take an "AS* WHIPPING" on your home field. Could have easily been another high 40 or even 50 point beat down if Dabo didn't put the 2nd & 3rd string in the 4th qtr. What a joke their fans are and an even more a pathetic joke is Mus-chump for accepting that behavior from their fans. So very proud of our Tigers!!!! They did not let this kind of actions affect their playing. I am especially proud of the way Kelly reacted when they tried to start something when he was on their sidelines and their players surrounded him shouting (who knows what) at him. Class act Kelly. The best way to handle something like this is to do exactly what our players did play and ignore and play within yourselves. Now onto Miami!!!! Tigers get it done....BRING IT and lets get that Championship. Stay focused, believe in yourselves and each other, they will try to get you guys out of your game. BELIEVE and EXEUTE and BE the team at the end of the game as CHAMPS!!! Go Tigers!!! A tale of two sides. One was beautiful team effort to dominate a good gamecock team in their stadium. It was also beautiful to see our team rise above the ugly reception they received. The expected ugliness there is sad imo. 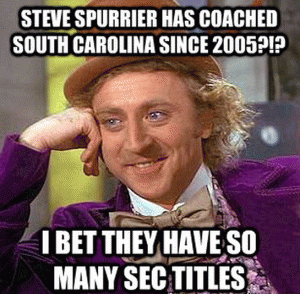 Even when we went 0-5 we lost with dignity despite constant barbs from Spurrier and their fans. Make no mistake, there is a difference between the team and fans of Columbia and Clemson. Let's give thanks. "...stuff being thrown, that's just how they have been." Says the senior Hunter Renfrow. That speaks volumes. SCAR has more than it's share of classless fans. I can't tell you how many SCAR fans and their young kids have told me to my fact that Clemson Sux over the years. SHAMECOCKS!!!!! Last night's game had the same feel as The Brawl Game --- SCAR fans and players were MAD before the game started. We are fortunate that no one got hurt. You can credit Dabo and the culture that Dabo has created at Clemson. do the same thing when the coots come to the Valley? They might get by with it a few times but after the first warning security would be dispatched to the area and folks would be removed from the stadium.